If you didn’t think fake clinics could get any creepier… introducing MOBILE MEDICAL UNITS! That’s right. Fake women’s health centers nationwide deploy Ultrasound VANS — fake clinics on wheels — to trick, manipulate, and pressure pregnant people, hindering their access to actual medical care. “Our MMUs allow pregnancy resource centers to operate anywhere abortion-vulnerable women are likely to be – outside of abortion clinics, on university campuses, and at public events.” — Save the Storks, one anti-abortion group that has launched more than thirty “Mobile Medical Units” across the country. 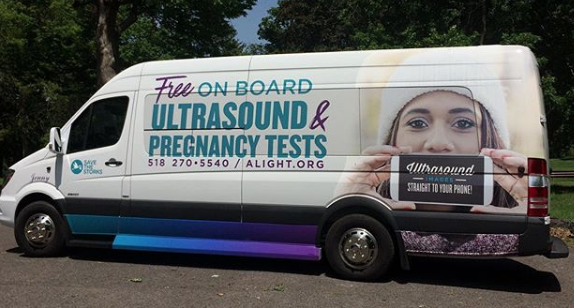 These sketchy vans come fully equipped with ultrasound machines that don’t require a medical license to use, pamphlets and volunteers full of misinformation, and usually ZERO medical professionals! Where can you find a fake clinic on wheels? They tend to hang out by college campuses, high schools, busy intersections, and fairs, or near county offices that offer support to parents with low incomes like WIC or TANF. Most frequently, they park right in front of legitimate reproductive health clinics in order to confuse patients and lure them inside. Fake clinics also work closely with anti-abortion extremist groups, like 40 Days for Life, so you'll often find them where you find protesters harassing patients. Let everyone know just how creepy these folks are by posting a picture of the van and where you saw it on Instagram & other social media. Tag your local City Council member or DepT. of Consumer Affairs. Do they know this sketchy van is your community, the people inside pretending to be medical providers for the sole purpose of lying to and preventing pregnant people from having an abortion? And if you want to be extra bold and get out of the car to take your pic, click on the image below to download your very own 11x17 poster to hold for a selfie in front of your local mobile fake clinic! If you'd like to visit a mobile fake unit and review the experience online, go with a friend! (Because you really shouldn't get into a car with strangers.) Just please make sure you don’t record anything without people’s consent! And spread the word! Encourage your friends to #GramTheVan when they see it parked somewhere. You can even download this flyer (below, left) to hand out at events! John Oliver and Rachel Dratch show just how absolutely bonkers Mobile Fake Clinics are (and highlighted the work of some #EFC members!) in this hilarious segment on Last Week Tonight!